A frequent email request from readers is help in configuring a computer for video editing. There are many options and, sometimes, it is hard to decide the best place to spend your money. Yes, the launch of the new MacBook Pro has had its share of controversy. But, what if you still need to buy a laptop for video editing? What do you really need? How much do you really need to spend? You don’t need to spend a fortune to get the right system. Let me help you decide what you need to buy. There are many reasons to buy a laptop, with portability leading the list. However, the MacBook Pro has enough power that you can reasonably consider it for your principle editing system, especially when you combine it with an external 5K or 4K monitor. Whether you are running Premiere or Final Cut, larger screen sizes help. Both these interfaces work better on larger screens. Second, while Apple has expanded – and vastly improved – the speed and storage capacity of the MacBook Pro, I still recommend storing projects and media on an external drive. While there is a benefit to storing everything on the internal hard disk – portability and speed being two of them – using a second drive allows you to move projects between computers, as well as access to your data in the event your computer goes into the shop. However, for best results, you would be well-advised to consider an external SSD if you want speed, or a RAID if you need more storage space. Single hard disks will work, but don’t equal the performance of the laptop itself, or these other two options. 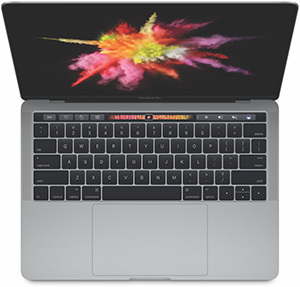 DOES THE TOUCH BAR MAKE A DIFFERENCE? I think it does. I found it increasingly helpful as I worked with the unit. NOTE: Here’s an article that explains how the Touch Bar works in Final Cut Pro X. SHOULD I WORRY ABOUT BATTERY LIFE? I think the current battery controversy will be resolved quickly through software. However, even more than that, video editing burns through batteries, regardless of how long they are supposed to last. For me, all my editing – even on the road – is done when I’m attached to wall power; excepting only the very tiniest projects. Since I’m never on battery power for editing, how long the batteries last is not an important consideration for me. UPDATE: The battery issue was traced to a bug in the OS. This is no longer an issue. If you are principally doing video editing, you can save money by purchasing the 2.6 GHz processor. Both Premiere and Final Cut heavily leverage the GPU and, while the CPU is important, if you are on a budget, you can conserve dollars here. UPDATE. As the processors and speeds have changed, read this now as: Editing does not require as fast a processor as video compression. The base level processor will be fine for most editing, while a faster processor will benefit compression. However, if you are principally doing transcoding and compression, then the faster CPU makes sense as both of these tasks use the CPU much more than the GPU. NOTE: Keep in mind that all the new MacBook Pros use hardware acceleration for H.264 compression, which makes creating videos for the web extremely fast even on slower processors. UPDATE: And, the 2017 versions now support hardware acceleration for H.265 video. If budget is driving this decision, selecting the slower processor will be fine, the differences between the two are not significant enough to warrant the extra cost. The internal SSD storage of the new MacBook Pro is the fastest I’ve ever measured. It is SERIOUSLY fast! If you plan to store your media and projects on an external drive of some sort, then get the 256 GB SSD. The operating system and all your applications will take less than 30 GB, leaving plenty of room for temp files and general work space. However, if you need to have everything stored on the laptop itself, buy the most storage you can afford. SSDs have continued to increase in storage capacity. If you plan to store media externally, you don’t need a very large SSD. Again, the OS only takes about 30 GB of storage. UPDATE: Here’s an updated article on storage speeds and media requirements that will help you put your storage needs into perspective. There are three different Radeon GPUs: the 450, 455 and 460. The distinctions between them are the number of compute units – 10, 12, and 16, respectively – and the amount of VRAM – or RAM attached to the GPU itself. The 450 and 455 have 2 GB of VRAM, while the 460 has 4 GB. More compute units means more processing power, while more VRAM means faster performance. NOTE: You can read more about these Radeon GPUs here. UPDATE: With the 2017 upgrade, all GPUs were renamed, but not change. So, the Radeon 450 is now 550, 455 is now 555, and 460 is now 560. Performance and recommendations have not changed. If you are principally doing video editing or motion graphics work, purchase the 455 or, if you can afford it, the 460. If you are principally transcoding and compressing, the base-level 450 GPU will be fine. SHOULD I WORRY ABOUT RAM? All 15″ laptops have 16 GB of RAM. My tests have shown this is more than sufficient for virtually all video editing. NOTE: Here’s an article that goes into editing performance on the MacBook Pro in much more detail. DO I NEED CONVERTER CABLES? Yes. The MacBook Pro only has USB-C ports. If you have existing devices, you’ll need a converter cable for Thunderbolt 2 devices and a second cable for traditional USB devices. NOTE: Apple also realizes that we are in a transition phase between ports, so they’ve extended their promotional prices on Apple USB-C adapters (specifically, USB-C to USB-A, Thunderbolt 3 to Thunderbolt 2, and USB-C to Lightning). Plus, the reduced pricing on the new LG 4K and 5K monitors have been extended to March 31, 2017. Also, if you have a lot of devices, consider a dock, which takes a single USB-C cable from the computer and splits it into a wide variety of separate ports. 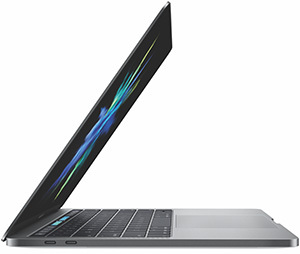 The base level 15″ MacBook Pro is $2,399 (US). This will be fine for all SD and general HD editing that is not effects-heavy. Adding a higher performance GPU to this system will improve effects and color grading performance and be adequate for virtually all HD editing, even multicam work. This raises the price to $2,599. And, for those of you who believe that money is no object, the top of the line system complete with all the storage Apple can cram into it, will set you back $4,299. With everything I edit using both HD AVCHD files as well as 4K h.264 mp4 files from a Canon C200, I can rarely playback the video in my timeline without constant freezes of the image. It seems like the system can’t handle any of my footage.I’ve tried changing the render settings to OpenCl, Metal and software only and I’ve tried to playback at 1/8 resolution and still have the same problem. Is my system missing something, or do I need to have the laptop serviced? Thanks so much for your time. * Set render settings to Metal. * Try creating proxies to see if they play better. 4K AVCHD is REALLY hard for most computers to process in real time. * The Intel GPU won’t be fast enough. Adobe is continually improving H.264 performance. Make sure you are running the most current version. Thanks so much for a lovely article. I’ve been a long time follower of your articles/videos and have much to credit you for all my editing abilities. I mostly edit HD videos and I am anticipating working with 4K videos in the future (and getting into colour grading and more). I plan to buy the new 2018 MacBook Pro. Between 2.2 GHz and 2.6 GHz, which one should I buy? It seems like there isn’t much of a difference. Also, is 16GB RAM enough or should I go for 32GB? And finally what GPU would you suggest? First, if you have the money, buy the most of everything. That is always the ideal choice. However, if you have to prioritize, and you need portability, buy a 15″ MacBook Pro. If you DON’T need portability, you will get more power for less money by buying an iMac. Laptops don’t have the same power as a desktop. * GPU – get the fastest you can afford. Much of video editing is moving to the GPU. * CPU – CPU speed is not as critical as it used to be, but still makes a difference in video compression. You’re truly generous with all this knowledge sharing! Thanks for all the great info you provide. How do you think this would handle small (under 15 min) projects in premiere at 1080 and also 4k? It’s the top end 2018 macbook pro 13 inch with 16g ram? * Are you doing multicam editing, if so, how many cameras? * How tight are your deadlines? * How heavily will the system be used? Your system will totally work. The bigger question is whether it will work FAST enough to meet your deadlines, given the media it is editing. If you aren’t creating 4K projects, or 6-camera multicam work, on a daily deadline, this is a nice system. Thanks for the reply Larry. I would mostly be using 1080 h264 files at 30 fps but would like to start to getting into 4k ( maybe proxie files would be the way to go). No multi cam but effects like titles, color adjustments and tracking. Also some AE compositing. I would rather have the Imac but don’t want to spend the money on a 2017 machine. Also I’m wondering about a lack of GPU power in 13 inch. This is basically a fine system, my biggest concern is that a 13″ screen is going to feel small for video editing. What a faster GPU gets you is NOT higher quality, but faster render times. You have a good amount of RAM and a fast SSD, so, overall, your system will edit quickly. 256 GB is not a lot of storage, so plan to get some external storage as the number of your projects expands. Thanks for the help Larry. Thank you for the helpful article. 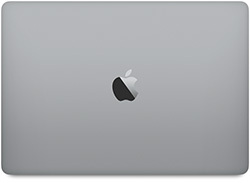 I am getting ready to purchase a 15” MacBook Pro and have a limited budget and will have to make some choices. Right now I am using a MacBook Air with Final Cut, most recent version, and it barely does it. I shoot 4k, color grade, usually two or three cams, and other effects. I usually shoot 24fps but sometimes 60. Deadlines aren’t tight but I am tired of a machine that barely does the job. My question is first will this work for what I am suggesting and second if I was going to upgrade in one area, which is all I can afford, where would you upgrade. I like all these specs. If you can only invest in one thing – AND assuming you have sufficient high-speed external storage, because 256 GB won’t be enough for the media projects you contemplate – then buy the best GPU you can afford. ANY GPU will work – what you are spending your money on is more speed. FCP X and Premiere both highly leverage the GPU for effects and export. If you don’t have a fast RAID, spend your money on that before buying a better GPU. Larry this is supremely helpful. I am just starting out in the video editing field. I will be editing videos for my YouTube channel. I would love to be able to edit in 4k at 60 fps but from what I have been reading here and else where it sounds like this is irrefutably out of the question. So I will be mostly editing 1080p at 60 fps. Most of my ‘editing’ consists of just trimming clips, maybe adding some audio. I am currently looking on Apple’s ‘refurbished’ page, as they have some great deals right now. Tax refund comes in a couple days. What setup do you recommend? There is extremely limited value in posting 4K media to YouTube – 1080p is more than adequate. As for buying refurbished gear, my recommendations remain the same in terms of how to prioritize spending money. I have a 2TB Seagate external hard drive so I’m not too worried about the 256GB. Let’s say I want to err on the side of extreme caution. Hypothetically i’d like to be able to edit with Final Cut, edit music with Logic, have browser tabs open, run photoshop and be able to play videos at the same time. Do you think the 16 GB RAM is sufficient or should I jump to 32? Thank you again for your insight!! FCP X, Logic, and Photoshop are all applications that demand as much RAM as you can give them. If you truly do want to run these all at the same time and you want decent performance, then 32 GB of RAM is a good choice. Also, keep in mind that storage capacity (2 TB) is only part of the equation, how the storage is connected determines its bandwidth. If this is a single, spinning hard drive, you’ll only be able to get about 150 MB/second from it. This is enough for HD, maybe enough for 4K, but not enough for HDR, 10bit media or multicam work. Even if you connect via Thunderbolt 3, one spinning drive is not very fast. An SSD is about 400 MB/second, while the latest NVMe solid state drive are up to 2.8 GB/second. Just FYI. Hlo i have a confusion .i have my mac book pro i5 with retina display.2012 model. Plz tell me should i use leatest version of fcp and its leatest plugins in it..plzz reply as soon as possible.. If you can run the latest version of macOS on your laptop, you can run FCP X. Whether you will get the performance you expect is an entirely different matter. Personally, I think you are reaching the end of life for upgrades for that gear. At some point, I would stop upgrading it and start saving for a new computer. Just use it with the software you currently have on it.